This stylish and contemporary bar unit offers great features and functionality. Space saving wine glass racks and ample shelf space for bottle storage, makes this bar unit the ultimate entertaining spot in your home. There is a rich cappuccino finish with a large serving surface. 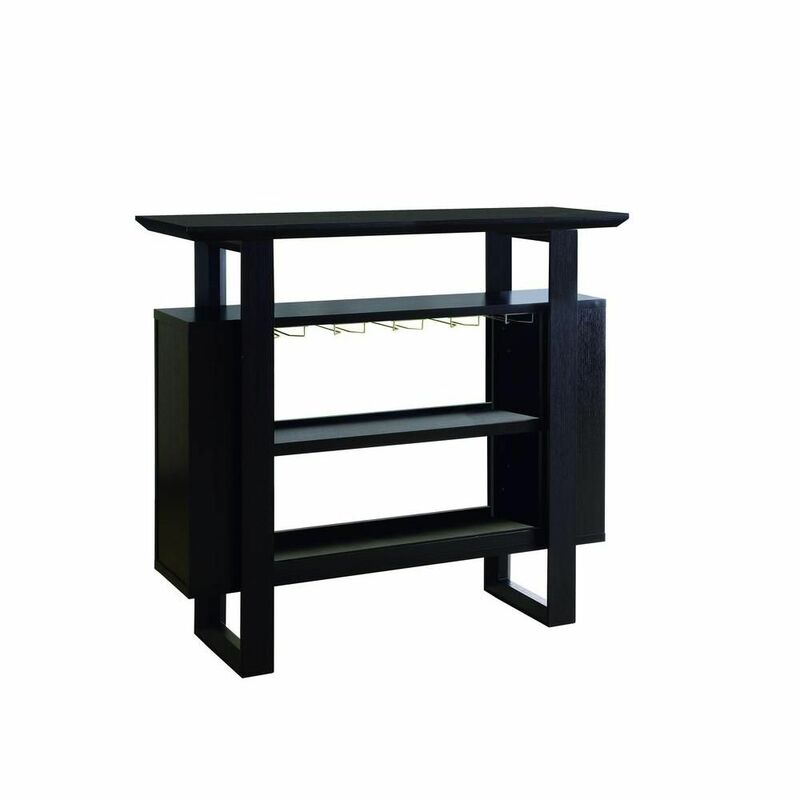 This stylish and contemporary bar unit offers great features and functionality. Space saving wine glass racks and ample shelf space for bottle storage, makes this bar unit the ultimate entertaining spot in your home. There is a rich cappuccino finish with a large serving surface. Rich, dark tones are complemented by straight, clean edges making this freestanding bar unit the perfect modern addition to your entertaining space. From top to bottom, it offers practicality with loads of storage and display possibilities. The tempered, smoky black glass top is ideal for pouring drinks while entertaining. Below it, multiple inverted racks are great for hanging wine and martini glasses securely yet within easy reach; and six shelves are highlighted with chrome-finished ledges. The unit it grounded with its center console providing ample space for up to 15 wine bottles and a cabinet for even more bottles of your favourite spirits. Home Bar - 48"L / Cappuccino With Bottle / Glass Storage This stylish and contemporary bar unit offers great features and functionality. Space saving wine glass racks and ample shelf space for bottle storage, makes this bar unit the ultimate entertaining spot in your home. There is a rich cappuccino finish with a large serving surface. Home Bar - 48"L / Cappuccino With Bottle / Glass Storage is rated 1.0 out of 5 by 1.